Albatross v Newcastle upon Tyne, Anglie: Zarezervujte nyní! 10% payment is due when booking is confirmed. The outstanding balance to pay is 14 days prior to arrival. Cancellation policy - for any amendments is 2 weeks prior to arrival. NO refund or reduction in numbers are possible thereafter. 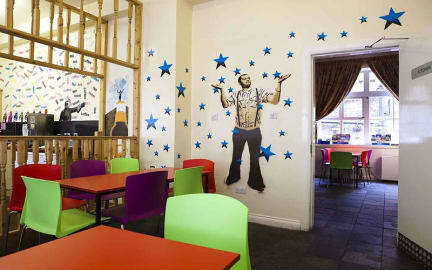 This clean and modern backpackers hostel is located in Newcastle's City Centre. It is walking distance from sporting and musical venues, food markets, art galleries, historical attractions and great links to the local and national transport. We are a fantastic venue to stay at as part of the Hadrians Wall Walk and the Coast to Coast route. So come discover the North East, and get ready for Newcastle's highly acclaimed night life. All guests must provide a key deposit on arrival. This can either be £5.00 in cash per person or 1 photographic ID which can cover up to 3 key cards. Further policies apply to bookings of over 3 guests. Any number of guests exceeding 3 are classified as a group. Groups must accommodate and pay for full rooms – this may not be reflected on booking but we will email you if any amendments will be required. For groups we require payment 2 weeks prior to arrival – this is to ensure payment is received and for a quicker check in on your arrival. I stayed at Albatross repeatedly a few times in August 2017. I felt safely and appreciated that the hostel is clean. Complimentary tea and coffee is great value as well as bread (although I do not eat it). Staff is friendly and helpful even if a client is a little bit confused... Many thanks to Nicole and Craig. I can recommend the Albatross to 100% and will stay there again in case of being in Newcastle.